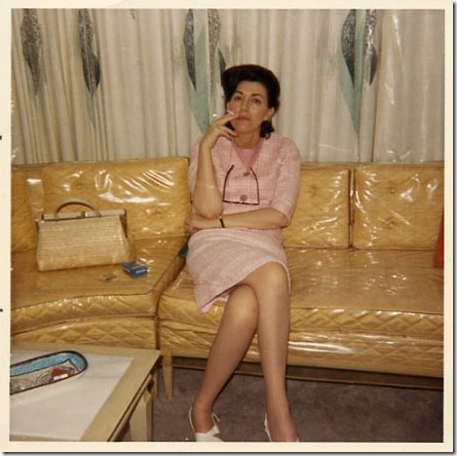 Back before home air conditioning was available, plastic or vinyl slipcovers were made for upholstered furniture during the summer months to protect it from sweat (and you thought your mom was just doing this to be annoying!). 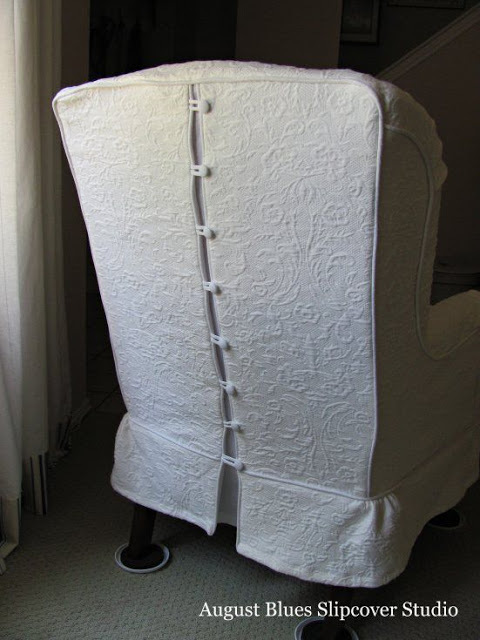 Slipcover tailors in the United States were often referred to as ‘”Summer Millionaires” because of the high demand during the hot summer months. Since then, slipcovers have evolved into an industry of their own. 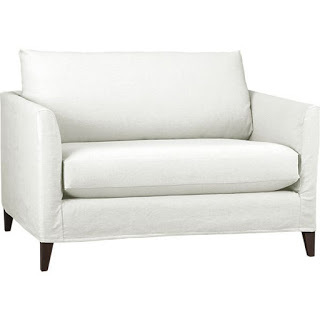 Most major furniture manufacturers, whether high-end or discount, offer many of their upholstered pieces with a slipcover option. 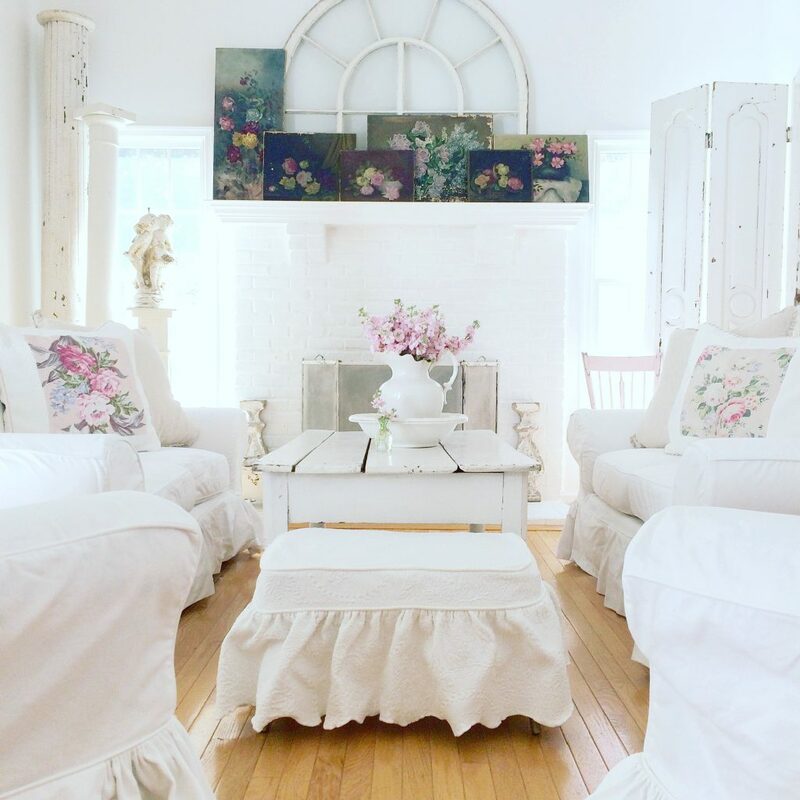 Whether your sofa is soft and cushy with tons of ruffles or modern and edgy with clean lines, chances are there’s a slipcover just ready and waiting for it. I’ve been using slipcovers for over two decades, and have learned the best ways to care for them and want to share that knowledge with you. 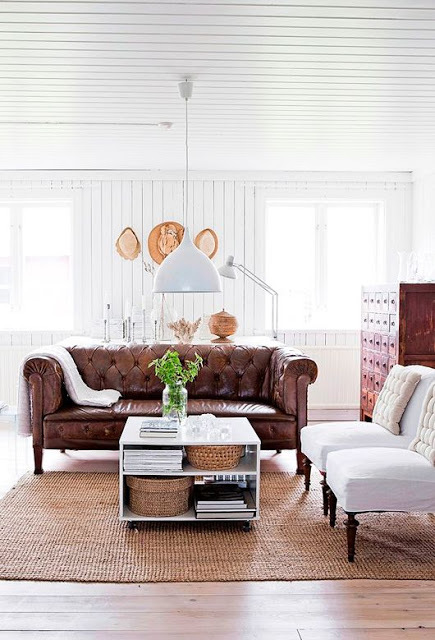 I have always had white slipcovered furniture (with one exception – when my husband – then boyfriend – bought a 20 piece sectional sofa that was brown plaid and it was so big we could not fit the whole thing in one room. I still have nightmares.) My fabric of choice is heavy, white denim. I have used less substantial fabrics, but they drastically cut back on the life of the slipcover. Repeated sitting, spot-cleaning, washing and stretching them to fit after cleaning breaks down the fibers in the seams. 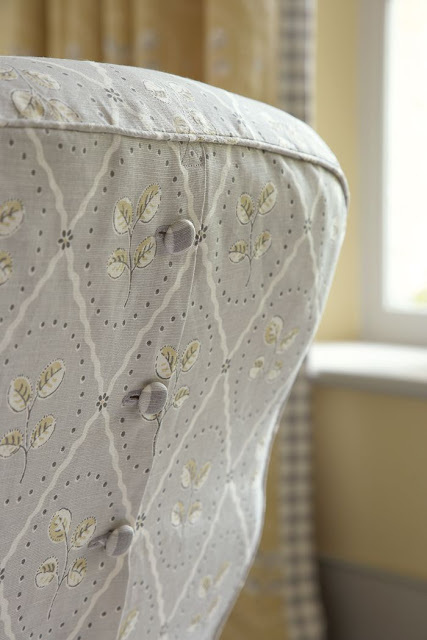 The sturdier the fabric, the longer your slipcovers will last. Custom made slipcovers are a bit more expensive than ready-made, but they will last much longer than those produced en masse. 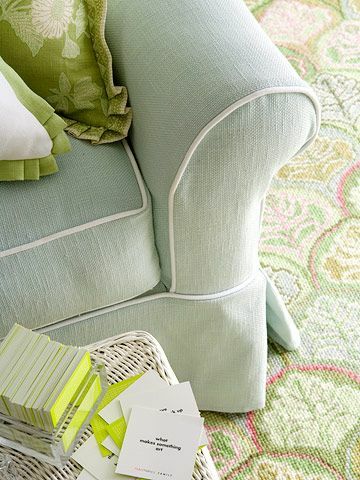 If you do opt to buy manufacturer’s pre-made slipcovers, always ask if they have been pre-washed. 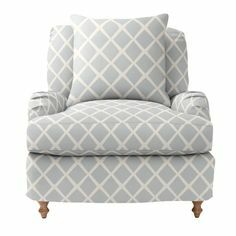 Many upholstery fabrics have been treated with stain resistant chemicals that will wash off in the laundry and they MUST be dry-cleaned. If your slipcover says “dry clean only”, I would heed that advice. If you have a stain you cannot remove, and you’ve gone against the recommended cleaning guidelines by washing it at home instead of dry-cleaning, chances are you will void any warranty that was included with your purchase. 1. No fading from the sun. It is amazing what ambient UV light can do to fabric. White does not fade. 2. You can bleach away just about anything, from red wine to dirt, to jean dye that has rubbed off from new jeans (yep, I’ve experienced all of this). 3. They always look clean and fresh, even with just a quick vacuuming. Mine have been through 20 years of family life: from toddlers to pre-teens, teenagers to twenty-somethings, and survived. Are they flawless? No. But they are still extremely presentable and there are only two small spots on one cushion that I can’t get out and I think this might be leftovers from when my daughter tried to color them orange with a Sharpie. (Dad was on Mom Duty that day.) It is best to purchase your fabric first, and wash and dry it several times. This will just about guarantee that there will be no shrinkage and it also breaks in the fabric nicely so it is soft and pliable. Most fabric stores have tailors that work exclusively for them. This is how my slips were made. A wonderful man came to my house and took all my furniture along with my pre-washed fabric. 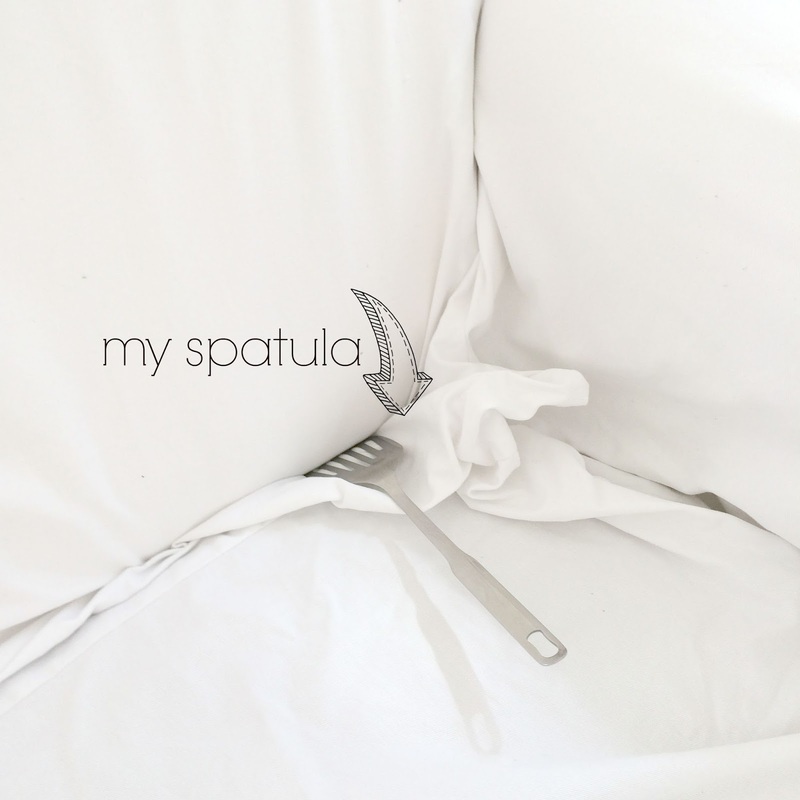 He returned everything several weeks later with custom made slipcovers that fit perfectly. Some tailors will measure your furniture at your home then make them in their studio. But for a truly custom fit, it’s best that the tailors have access to your furniture while they are sewing the slips. Line the skirt (the bottom portion of your slip) whenever possible. This makes the skirt slightly stiffer and it will hold the shape nicely. And you need a bit of extra “oomph” at the bottom because that area of the sofa will see the most abuse from shoes, dust, etc. 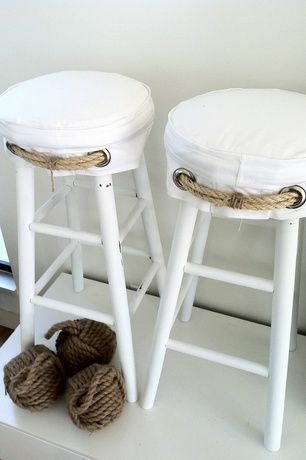 Include piping whenever possible, especially on seat cushions. Piping adds another two layers of protection: You have a regular seam which holds two pieces of fabric together – add some piping- and you have four layers of fabric and two seams. Very tough to rip through. Always use the best-quality zippers possible, preferably with large teeth. I think the belief is that matching the color of the zipper to the fabric is the right thing to do – but those zippers are plastic and you should never use plastic zippers on slipcovers. There are many affordable metal ones made from brass or aluminum, and they will not show at all. My slipcover zippers are similar to the one on the top right, except the teeth are silver. They have never broken or bent and are in perfect condition. I advise pre-washing these too – as some cotton tape on the zippers will shrink causing the fabric to bunch up. Some tailors use buttons instead of zipper for chairs. I think this is fantastic and I am a big fan of dressmaker details for slips. I don’t recommend them for larger pieces though. Rit products have been around for decades and they are truly wonderful and affordable. I add the powder or liquid (depends on which one I have on hand at the time) in addition to Oxi Clean and my regular detergent. The slips come out of the wash looking brand new. If you have stains, I recommend spot treating with the diluted bleach option first. The best stain remover I have come across is Club Soda (this is how I removed the red wine and orange Sharpie). Sometimes I will just add Club Soda to the wash load. It is an amazing stain remover and brightener. Remove your slips from the washer and lay across chairs – not across your upholstery pieces as this will create a mold environment. 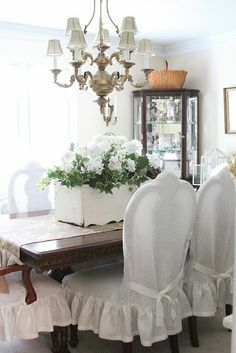 Spread them out over chairs, so that the air can circulate around them. I usually just do one sofa at a time (for lack of drying room). 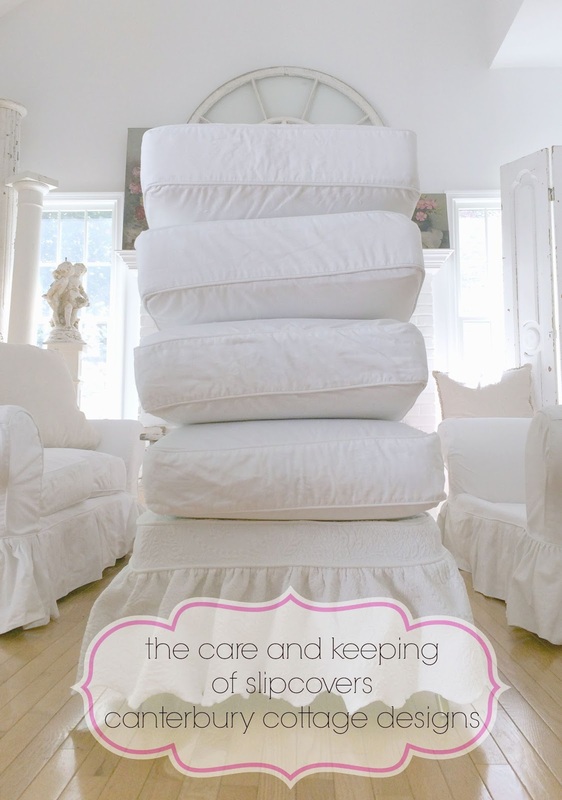 Once they are dry, you can fluff them in the dryer on the “no heat” setting or put them back on the furniture immediately – they will soften up on their own over time. Some people recommend putting the slips back on when they are damp, but I do not. Under damp conditions, mold can grow between the slip and sofa. Putting slipcovers on can be a hard work. You will have to work your way around the sofa, easing and pulling fabric, so that each corner fits. Start with one back side, then move to the corresponding arm, then to the next arm, and lastly, over the back of the sofa. It may require several tries to get them back on. You will work up a sweat and are allowed to skip the treadmill on slipcover days. After the slips are securely on the sofa, the loose fabric on the seats (underneath where the cushions go) will need to be tucked into the sofa. I use a spatula or wooden spoon, ruler, or anything straight. This ensures that the slips will stay put and you get a nice, crisp look doing it this way. Lastly, put the fresh slips on the cushion pillows. Remember, if one side of your cushion gets ruined, you always have another side. And you will add years to your slips by flipping your cushions often. If you want a more tailored look, lightly steam out the wrinkles with a hand-held steamer. I am not a slipcover snob, I have two white sofas in my basement that I purchased from Ikea, covered with white slipcovers. I have washed them and they came out perfect. Ikea slipcovers are very wrinkled – both after washing and when you take them out of the package new. There is a way to get rid of those wrinkles. Using a spritzer bottle filled with water, lightly mist the wrinkles and smooth them out with your hand. This really works! Vacuum your slipcovers with the upholstery brush on your hand-held vacuum ever other week or so. They will sparkle. 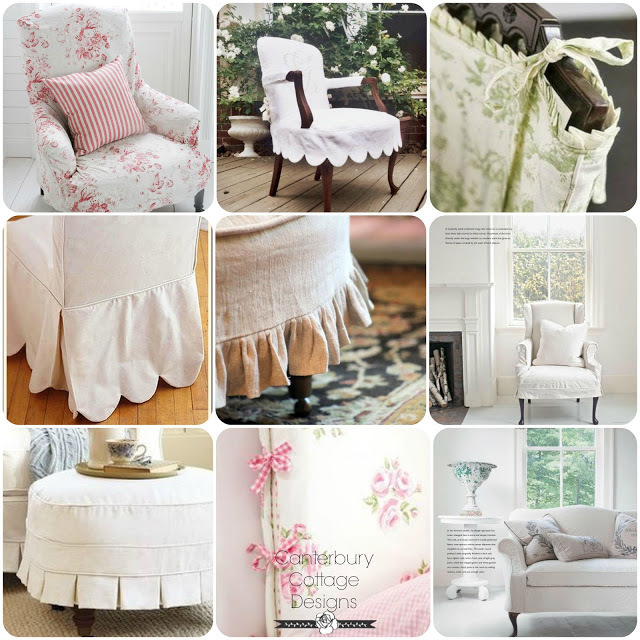 Slipcovers transform the old and extend the life of your furniture for years- or in my case – decades. And to me they are worth their weight in gold. 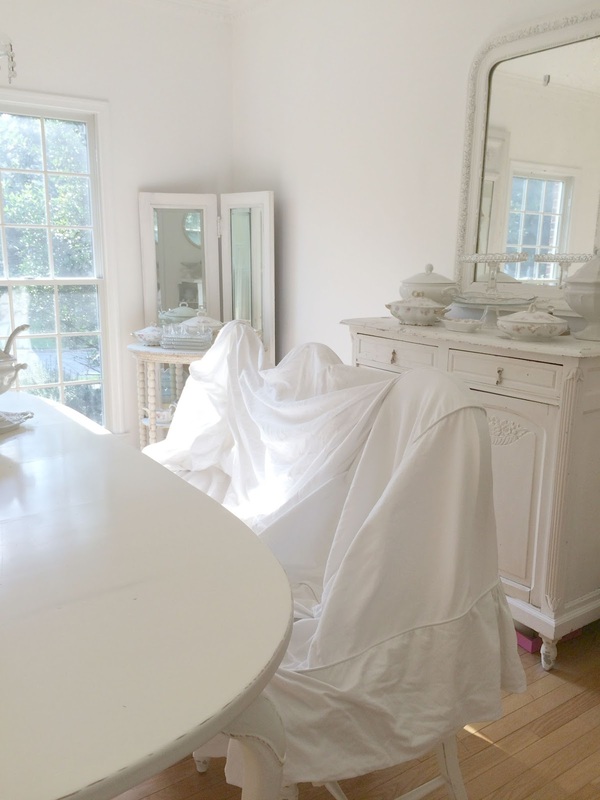 I would love to hear your thoughts on slipcovers and how you care for them!